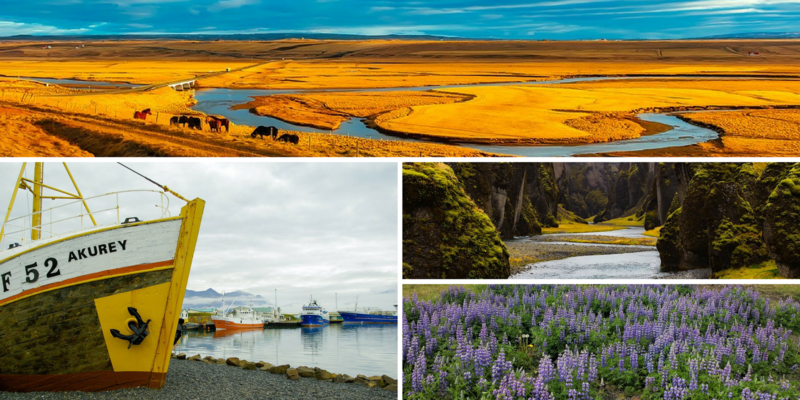 When is the best time to go to Iceland? All year round, of course! The beautiful thing about Iceland is that no two days are the same – and that’s because the weather can be so changeable. Iceland isn’t a country where people should wander about on their own, unless they are prepared for the weather. Some parts are so uninhabitable that I always recommend that my clients are accompanied by an experienced guide. After all, the wildest places are always the most spectacular, but also the most unpredictable. So when is the perfect time to go? Winter can be a very pretty time to visit, but it does get colder then so avoid December-February if you don’t like ice and cold winds. Although it never goes below 15°C in the North. For those that love photography and breathtaking views, just pack your thermals and get ready for sights that you’ll never forget! When people think of Iceland, they often think of the Northern Lights, which appear late September until end of March. If you love taking photos and long days outside, then avoid November through to January. These are seriously dark days with just a few hours of sunlight a day. Because of Iceland is the land of ice and fire – on the flip side, the ‘bright nights’ are April-September with June and July giving you the chance to see the midnight sun. Yes, this sounds ideal but it also means that it’s difficult to sleep, so bear that in mind. By August, the nights begin to darken. For those interested in whale watching, contrary to popular belief this can be done all year round. From Spring to Autumn is best! I work with the country’s best boat guides and nature experts, ensuring that you will see some truly unforgettable animals. The best thing about having your own bespoke planner is that I advise on all the things that are vital for making your trip not only exciting but safe and comfortable. Driving conditions, security and clothing – you’d be surprised how many women I’ve known to climb a volcano in high heels! I also ensure that my clients keep away from the touristy places while still being aware of the most popular places. So you are free to pick and choose as you wish. Most importantly I am in constant personal contact with all my colleague and partners in Iceland. This ensures you get the very best in quality and personal service. All in all, there’s no bad time to go to Iceland. Simply make sure you consider the time of year when we talk about the activities you’ll like to do there and the things you would like to experience. If you have any further questions, just fill in the Contact Form and I’ll be in touch.